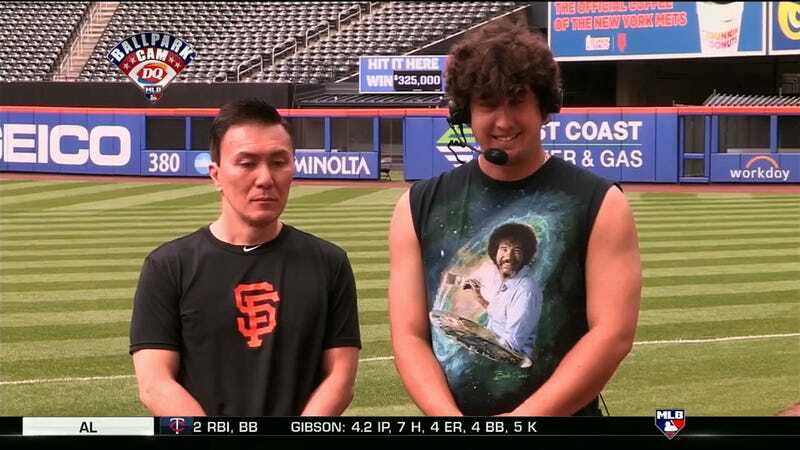 When San Francisco Giants pitcher Derek Holland went on MLB Network’s Intentional Talk with Kevin Millar and Chris Rose on Wednesday, he chose to conduct the interview with the team’s massage therapist Haro Ogawa at his side. Holland introduced Ogawa as his “hype man,” but never used Ogawa’s name or position throughout the interview. Then, Holland performed an Asian caricature so bad, John Hughes would’ve used it for Sixteen Candles. Holland bowed at Ogawa, uttering “much respect.” This would’ve been offensive if he’d done it only once, but he did it three times. Though Ogawa, a native of Japan, was seemingly in on the whole charade, he was a prop for comic relief—just an ancillary part of Holland’s dehumanizing stunt. The entire joke driving the segment is that Ogawa is Asian. Curiously, when MLB.com published the interview on its site, it didn’t include these parts.